Precision down to the last centimetre: the new synchronmous mowing deck with a width of 125 cm ensures a perfect cutting pattern. The catching management system catches grass blades right up to the edge of the mowing strip. The grass catcher box can be easily emptied from the seat with one hand. The extremely powerful engine, the forward/reverse drive lever, the ergonomic control panel with LCD display, the extremely small turning circle and the excellent driving characteristics take the hard work out of lawn mowing. And with the new design, the RT 6127 ZL model looks good even when stationary. The LCD display is designed to indicate the following functions: Operating hours, battery voltage, grass catcher box ready, fuel tank level, oil pressure control, grass catcher box filling level, driver seated, mowing deck activation, cruise control, programming, electromagnetic blade clutch, fault indication. Cruise control: The cruise control function also provides driving comfort. It can be conveniently activated at the press of a button in the control panel and permits exertion-free working, particularly during prolonged mowing on large lawns, thanks to automatic control of speed. Innovative forward/reverse drive switching thanks to the simple reversal mechanism, the driving direction can be selected using the drive direction lever. The hydrostatic gearbox is controlled via the drive pedal on the right. 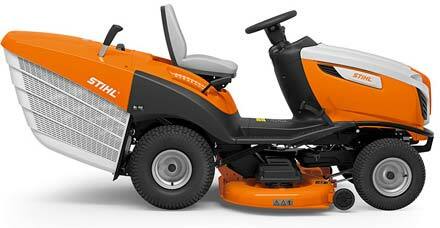 Electromagnetic blade clutch (EBC): Activation of the mowing deck is via a clutch system. Convenient: The electromagnetic blade clutch makes blade activation easy. The mowing deck is simple to activate with a button press on the touch panel; pressing the button again disengages the blades. Single-pedal self-propulsion with hydrostatic gearbox: drive pedal on the right, brake pedal on the left. Comfortable single-pedal self-propulsion with hydrostatic gearbox. Central cutting height adjustment: The lever for centrally adjusting the cutting height is located immediately next to the seat, allowing the cutting height to be adjusted as required from level 1 to 8. Synchronous mowing deck: Thegrass feed to the ejection chute is optimised by the synchronised rotation of the blades, which are offset by 90°. Grass catcher box with bow handle: The “dumper-design” grass catcher box can be emptied effortlessly from the driver’s seat by means of a bow handle. The grass catcher box design ensures optimum filling. No clippings are left behind after emptying. Integrated hitch: Integrated tow-bar for easy attachment of accessories. Turf tyres: Large turf tyres protect the lawn and leave virtually no tracks. Mulch insert: The mulch insert provided converts the STIHL ride-on mower into a mulching mower with very little effort. Simply remove the grass catcher box and push the mulch insert into the grass catcher channel. The clippings are then shredded so finely in the closed mower housing that they fall back into the turf and decompose there. This returns nutrients to the lawn.